Is a new kitchen supplied by a general builder a great money saver or a false economy? Often, when you’re in the market for a new kitchen, we’ll talk about it to friends, family and colleagues as we work through our thoughts on what we want and in the process of doing so we’ll often get comments about what they like, kitchens they’ve seen and where you can buy one from. In amongst those we’re fairly sure you’ll get someone saying “my builder can put a kitchen in for you” or “just buy your own and get someone to put it in”. Of course these statements are indeed true; a builder or joiner would have the skills needed to fit a kitchen for you and this may well be a cheaper option for you. But is it the best option? We’re sure that it must come as no surprise at all to you to hear that we’re going to make the case for that not being the wise option, but hear us out! 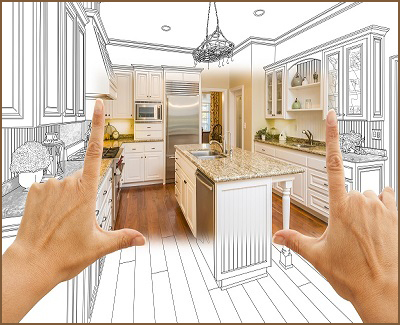 There are 2 aspects to a kitchen renovation project: choosing a kitchen and having it installed. But, is it that simple? We would argue that there’s a third aspect and that is the benefit of kitchen-specific knowledge and experience – or ‘kitchenology’ as we like to call it! From a strictly functional point of view, yes of course a builder can make a perfectly good job of installing a new kitchen and they can no doubt incorporate their skills into the project like knocking out walls, moving doors or building extensions to put them in. There is a lot to be said for one tradesperson undertaking the whole project. They may even have a mate who sells kitchens or has a deal with a local kitchen supplier and could save you some money there. This can be great, especially if you know exactly what you want or are working to a strict budget. But what if you don’t know exactly what you want? Or what if you don’t know what other options you have? The value that a kitchen specialist adds is that third aspect; the kitchenology! A professional that only deals with kitchens for their entire working life brings the knowledge and experience that can make all the difference in a kitchen project. Fitting a kitchen as a bit of a side-line is fine but do they know what really works well? Do they know about spatial planning? Do they know about kitchen design theory and what styles are out there and what kitchen figurations work the best? Do they know about colour and trends and materials? Do they know which handles work best with a Shaker kitchen or which taps are most suited to a Belfast sink? Can they follow a design brief or inspire you with ideas you may never have thought of? Do they know about the properties of different worktop materials or the options you have for splashbacks? Do they have access to a wide range of kitchens? A builder will do a perfectly fine job and create a perfectly fine kitchen but a kitchen specialist will do an exceptional job and create an exceptional kitchen, plus it’s not necessarily more expensive. As kitchen specialists who only offer kitchens, our entire supply network is made up of kitchen manufacturers and suppliers and we buy in bigger volumes than a builder offering the occasional kitchen so we procure at preferential rates. The design consultation that we offer is free of charge and because we only fit kitchens, we are efficient at the installation as well so that helps to keep control of cost. The only area where we’ll be more expensive is because we don’t fit cheap kitchens, we only offer good quality because we think that you get what you pay for and our reputation as kitchen specialists would only be tarnished by sub-standard quality. The kitchen you get from us is worth every penny because of the quality of the materials, the value of the design process and the attention to detail of the craftsmanship. By all means, get a quote from a builder or joiner or man down the pub who can get cheap kitchens, but book a design consultation with us so that you can see the difference and then judge who offers the best solution. We think it will be the kitchenologists! 2 Responses to "Trust us: we’re Kitchenologists!"